A protocol for the elucidation of plant thylakoid protein complex organization and composition with blue native polyacrylamide gel electrophoresis (BN-PAGE) and 2D-SDS-PAGE is described. The protocol is optimized for Arabidopsis thaliana, but can be used for other plant species with minor modifications. Rantala, M., Paakkarinen, V., Aro, E. M. Analysis of Thylakoid Membrane Protein Complexes by Blue Native Gel Electrophoresis. J. Vis. Exp. (139), e58369, doi:10.3791/58369 (2018). Photosynthetic electron transfer chain (ETC) converts solar energy to chemical energy in the form of NADPH and ATP. Four large protein complexes embedded in the thylakoid membrane harvest solar energy to drive electrons from water to NADP+ via two photosystems, and use the created proton gradient for production of ATP. Photosystem PSII, PSI, cytochrome b6f (Cyt b6f) and ATPase are all multiprotein complexes with distinct orientation and dynamics in the thylakoid membrane. Valuable information about the composition and interactions of the protein complexes in the thylakoid membrane can be obtained by solubilizing the complexes from the membrane integrity by mild detergents followed by native gel electrophoretic separation of the complexes. Blue native polyacrylamide gel electrophoresis (BN-PAGE) is an analytical method used for the separation of protein complexes in their native and functional form. The method can be used for protein complex purification for more detailed structural analysis, but it also provides a tool to dissect the dynamic interactions between the protein complexes. The method was developed for the analysis of mitochondrial respiratory protein complexes, but has since been optimized and improved for the dissection of the thylakoid protein complexes. Here, we provide a detailed up-to-date protocol for analysis of labile photosynthetic protein complexes and their interactions in Arabidopsis thaliana. Large multisubunit protein complexes photosystem PSI and PSII, Cyt b6f and ATPase coordinate the production of NADPH and ATP in photosynthetic light reactions. In higher plant chloroplasts, the complexes are located in the thylakoid membrane, which is a structurally heterogeneous membrane structure, comprising appressed grana and non-appressed stroma thylakoids. Blue native polyacrylamide gel electrophoresis (BN-PAGE) is an extensively used method in the analysis of large multisubunit protein complexes in their native and biologically active form. The method was established for the dissection of mitochondrial membrane protein complexes1, but has later been customized for the separation of protein complexes from the thylakoid membrane network3. The method is suitable (i) for the purification of individual thylakoid protein complexes for structural analysis, (ii) for determining native interactions between protein complexes and (iii) for the analysis of overall organization of the protein complexes upon changing environmental cues. Prior to the separation, protein complexes are isolated from the membrane with carefully chosen nonionic detergents, which are generally mild and preserve the native structure of the protein complexes. Detergents contain hydrophobic and hydrophilic sites and form stable micelles above a certain concentration, called a critical micellar concentration (CMC). Increasing the detergent concentration above the CMC results in disruption of the lipid-lipid interactions and in the solubilization of protein complexes. The choice of detergent depends on the stability of the protein complex of interest and on the solubilization capacity of the detergent. Routinely used detergents include α/β-dodecyl-maltoside and digitonin. Following the solubilization of protein complexes in their native state, insoluble material is removed by centrifugation. In higher plants, the thylakoid membrane is highly heterogenic in structure and some detergents (e.g., digitonin) selectively solubilize only a specific fraction of the membrane3. Therefore, to characterize the protein complex organization or the interactions between the protein complexes, it is crucial to always determine the solubilization capacity of the chosen detergent by determining the chlorophyll content and the chlorophyll a/b ratio of supernatant to assess the yield and the represented thylakoid (sub)domain, respectively, of the solubilized fraction. The chlorophyll a/b ratio in intact thylakoids of growth-light acclimated plants is typically around 3, whereas the chl a/b value of thylakoid fractions enriched either in grana or stroma thylakoids falls below (~2.5) or exceeds (~4.5) the value of the total thylakoids, respectively. To provide negative charge to the protein complexes, Coomassie brilliant blue (CBB) dye is added to the solubilized sample. Due to the charge shift, protein complexes migrate towards the anode and are separated on an acrylamide (AA) gradient according to their molecular mass and shape. Effective and high-resolution separation is achieved by using a linear acrylamide concentration gradient. During the electrophoresis, the protein complexes migrate towards the anode until they reach their size-dependent pore-size limit. The pore-size of polyacrylamide gel depends on (i) the total acrylamide/bis-acrylamide concentration (T) and (ii) on the cross-linker bis-acrylamide monomer concentration (C) relative to the total monomers4. After the separation with BN-PAGE, the protein complexes can be further subdivided into their individual protein subunits by second-dimension (2D)-SDS-PAGE. Here, we describe a detailed protocol for the analysis of thylakoid membrane protein complexes by BN-PAGE/2D-SDS-PAGE. Set up the gel caster with 8 cm x 10 cm plates (rectangular glass and notched alumina plate) according to manufacturer's instructions using 0.75 mm spacers. Place a gradient mixer on a stir plate and connect it with the peristaltic pump by a tubing. Attach a syringe needle to the other end of the tubing and place the needle between the glass and aluminum plate. Place magnetic stirrer to the "heavy" (H)-chamber. Prepare the 3.5% (v/v) and 12.5% (v/v) acrylamide (AA) solutions in 15 mL conical centrifuge tubes for the separation gel gradient (see recipes in Table 1). To prevent untimely polymerization, keep the centrifuge tubes on ice while preparing the solutions. CAUTION: Acrylamide is neurotoxic and carcinogenic, wear protective clothes and gloves. Add 5% APS and TEMED right before pipetting the solutions to the gradient mixer. Pipet the 12.5% solution to the H-chamber. Remove air bubbles from the channel connecting the "light" (L) and H-chamber by opening the valve connecting the two chambers allowing solution to enter to the L-chamber. Close the valve and pipet the traces of solution back to H-chamber. Finally, pipet the 3.5% solution to the L-chamber. Switch on the magnetic stirrer (the speed of the stir is not critical, but it should ensure proper mixing of the heavy and light solutions), open the valves and switch on the peristaltic pump. Allow the gel solutions to flow between the glass and aluminum plate, the flowrate should be roughly 0.5 mL/min. The needle must be above the liquid all the time, it can be attached to the upper part of the glass plate with a tape. When the H- and L-chambers have emptied, fill them with ultrapure water and allow water to gently overlay the gel surface. The gel polymerization takes around 1-2 hours at RT. Prepare the 3% acrylamide solution (see recipe in Table 1) for the stacking gel at RT. Pipet the stacking gel on top of the polymerized separation gel (before casting the stacking gel, remove the water overlaying the gel surface) and place a sample gel comb between the glass and aluminum plate avoiding air bubbles. Allow to polymerize 30-60 min at RT. Remove the comb gently under ultrapure water. Store the gel at +4 ˚C. Pause point. The gel can be stored at +4 ˚C for a few days. The gel should be kept in moist conditions to avoid drying of the wells and the gel surface. NOTE: All steps should be performed under very dim light. Keep samples and buffers on ice. Dilute isolated thylakoids with ice-cold 25BTH20G buffer to a final chlorophyll concentration of 1 mg/mL. For 2D-BN-SDS-PAGE analysis roughly 4-8 µg of chlorophyll/ sample is suitable. Add an equal volume of detergent buffer, i.e., 2% β-DM (w/v) or 2% digitonin (w/v). Mix the detergent to the thylakoid sample gently with the pipet tip and avoid making air bubbles. The final concentration of the detergent is 1% and that of the thylakoids 0.5 mg Chl/mL. Solubilize the thylakoids for 2 min on ice (β-DM) or 10 minutes at RT with continuous gentle mixing on a rocker/shaker (digitonin). NOTE: Digitonin and β-DM are generally used for the solubilization of thylakoid protein complexes. If other non-ionic detergents are used, the detergent concentration and the solubilization time must be first optimized. Usually the detergent concentration range from 0.5%-5% (v/v). Remove the insolubilized material by centrifugation at 18,000 x g for 20 min, at +4 ˚C. Transfer the supernatant to a new 1.5 mL tube and add 1/10 (v/v) of CBB buffer to the sample. NOTE: When the overall composition of the thylakoid membrane protein complexes is examined, determining the yield and the represented thylakoid domain of solubilized fraction is recommended. To determine the yield of the solubilized material, take 5 µL of the supernatant to a new tube (before adding CBB) and measure the Chl content and Chl a/b ratio5. Set up the gel to a vertical electrophoresis system (e.g., Hoefer SE 250). Fill the upper buffer chamber with blue cathode buffer (see Table 1) and pour anode buffer to the lower buffer chamber. Load thylakoid sample (e.g., 5 µg of chlorophyll) into the wells. Start the electrophoresis and gradually increase the voltage: 75 V for 30 min, 100 V for 30 min, 125 V for 30 min, 150 V for 1 h and 175 V until the complexes have been separated completely. Run the gel at +4˚C, either using a cold room or adjusting the gel temperature with a cooling system. NOTE: Change the blue cathode buffer to a clear cathode buffer when the sample front has migrated about one third of the gel. After the electrophoretic run, scan the gel with a photoscanner for image archiving. Assemble the vertical electrophoresis system (gel size 16 cm x 20 cm). Use 1 mm spacers. Prepare standard SDS gel (12% acrylamide, 6 M Urea, see recipe in Table 2) with a 2D-comb (single large well for the strip and one standard well for molecular weight marker). Cut the lane from BN-gel and place it in a (5 mL) tube. Add 2 mL of Laemmli buffer (containing 5% β-mercaptoethanol) and incubate the strip for 45 min with gentle shaking at RT. Place the lane, with a help of e.g., a spacer, on top of the gel avoiding air bubbles. Pipet 5 µL of molecular weight marker on a narrow piece of filter paper and place the paper to the standard well. To seal the BN-gel strip and the marker paper, pour 0.5% agarose (in running buffer) on top of the gel strip and allow to solidify. Perform electrophoresis according to standard protocols. After the electrophoretic run, visualize the proteins with e.g., Sypro Ruby stain or silver staining according to6. 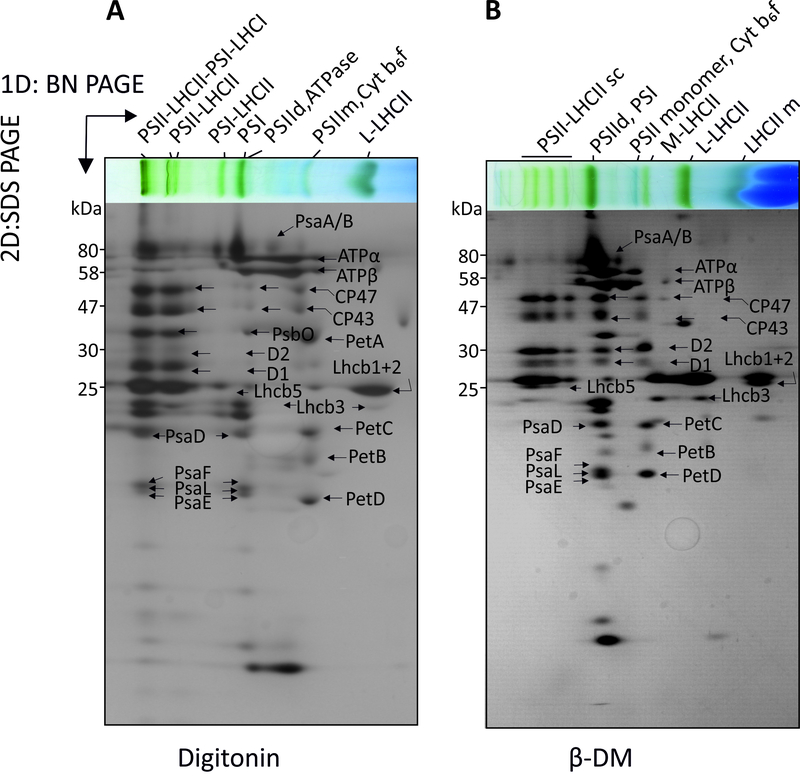 A representative 2D-BN/SDS-PAGE system in Figure 1 demonstrates the separation of digitonin and β-DM-solubilized thylakoid protein complexes and their detailed protein subunit composition. The protein complex pattern of digitonin solubilized thylakoids (horizontal gel on the top on the top of Figure 1A) contains the PSII-LHCII-PSI megacomplex, two large PSII-LHCII supercomplexes (sc), PSI-LHCII supercomplex, PSI monomer (m), PSII m/Cyt b6f, loosely bound (L)-LHCII trimer (Figure 1A). The slightly stronger detergent, β-DM, solubilizes the entire thylakoid membrane (horizontal gel on the top of Figure 1B), but is unable to preserve weak interactions between protein complexes. Thylakoid solubilization with β-DM typically produces four PSII-LHCII supercomplexes (with different amount of LHCII antenna attached), PSII dimer (d) and PSI m, ATPase, PSII m and Cytb6f, M-LHCII, L-LHCII and LHCII monomer (Figure 1B). Unlike β-DM, digitonin produces only minor amount of LHCII monomer. The protein complex pattern may differ depending on plant exposure to different light conditions and might also differ between mutant lines, since the protein complex interactions are dynamic and dependent on i.e., protein phosphorylation. SDS-PA gels below the native gel strips in Figure 1 A and B represent the polypeptide composition of each protein complex initially solubilized with digitonin or β-DM. Figure 1. A two-dimensional BN-PAGE/SDS-PAGE of Arabidopsis thylakoid. Thylakoid protein complexes solubilized with (A) 1% digitonin and (B) 1% β-DM and separated first by 1D-BN-PAGE (the lanes on top) and subsequently on 2D-SDS-PAGE to demonstrate the individual protein composition of each complex. Due to the incubation of BN-strips with denaturing Laemmli buffer, the protein subunits of each complex (in the BN strip) dissociate and are separated in a vertical line during the 2D-SDS-PAGE. The protein identification is based on mass spectrometry analysis presented in references7,8. Please click here to view a larger version of this figure. TEMED 3 µL NOTE: Acrylamide is neurotoxic. Add APS and TEMED immediately before use. The recipe is sufficient for casting one small BN gel. TEMED 2µL NOTE: Acrylamide is neurotoxic. Add APS and TEMED immediately before use. The recipe is sufficient for casting one small BN gel. TEMED 3 µL NOTE: Acrylamide is neurotoxic. Add APS and TEMED immediately before use. The recipe is sufficient for one small BN gel. 150mM BisTris/HCl (pH 7.0) Store at + 4 ˚C. 10 mM NaF (add freshly) Detergents can be prepared as 5-10% stock solutions (in water). If other detergents are used, the final detergent concentration has to be optimized. TEMED 28 µL NOTE: Acrylamide is neurotoxic.The recipe is suitable for casting one big SDS-gel. TEMED 10 µL NOTE: Acrylamide is neurotoxic. The photosynthetic energy conversion machinery is composed of large multisubunit protein complexes, which are embedded in the thylakoid membrane. This protocol describes a basic method for analysis of the plant thylakoid protein complexes from Arabidopsis thaliana with BN-PAGE combined with 2D-SDS-PAGE. The protocol is also suitable for the analysis of thylakoid protein complexes from tobacco and spinach thylakoids, but might require small adjustments. For the solubilization of membrane protein complexes, nonionic detergents are commonly used for their ability to preserve the complexes in their native form. Here, two commonly used detergents β-DM and digitonin were applied. Dodecyl maltoside solubilizes individual protein complexes, whereas digitonin can be used for the analysis of larger protein complex assemblies10. The bulky structured digitonin is unable to fit to the tightly appressed grana partitions and therefore solubilizes only the non-appressed regions of the thylakoid membrane3,11. It is therefore suited for the analysis of stroma thylakoids and grana margins. However, when digitonin is used together with aminocaproic acid (ACA), the combination solubilizes the entire thylakoid membrane, including also the appressed grana thylakoids12. Through an unknown mechanism, ACA allows digitonin to have access to the partition gap between adjacent grana membrane layers. Importantly, digitonin preserves labile interactions between protein complexes and can therefore be used for the analysis of labile protein super and megacomplexes, which are most abundant in the non-appressed thylakoid regions8. It must be noted that detergents always interfere with some of the labile interactions between the protein complexes and therefore it is not possible to isolate completely intact network of protein complexes. Some of the complexes are dissociation products that have been disconnected from larger protein complex associations during thylakoid solubilization and the electrophoresis. The quality of the BN-PAGE separation depends not only on the sample preparation (protein complex solubilization), but also on the quality of the thylakoid isolation, which must be done from fresh leaves. If special care is not taken, the PSII-LHCII supercomplexes typically degrade during β-DM solubilization. BN-PAGE maintains the integrity of the solubilized protein complexes. The separation capacity of the BN gel depends on the acrylamide gradient, and the gradient should be optimized based on the protein complexes of interest. The pore-size of the polyacrylamide gel can be modified by changing the concentration gradient (total acrylamide concentration, T) or by adjusting the bis-acrylamide concentration (C) relative to the total amount of acrylamide monomers4. The BN-PA gel gradient used here is optimized and well suited for the analysis of large protein super- and megacomplexes3. Importantly, pore-size of the stacking gel must be large to allow all complexes to enter to the separation gel. After protein complex separation with BN-PAGE, the composition or structure of each individual protein complex band can be further analyzed. For structural analysis the protein complex of interest must be eluted from the gel and most labile complexes may be destroyed during the elution. Therefore, sucrose density gradient is more often used for the protein complex purification for structural analysis. For the analysis of spectroscopic properties of the protein complexes in the gel, the clear-native PAGE must be used instead of BN-PAGE, since the Coomassie dye interferes with such measurements. For analysis of the subunit composition of the protein complexes, a denaturing 2D-SDS-PAGE is described here. The subunits of each complex are separated in a vertical line and can be easily identified. It has to be noted that several proteins may be present in a single spot and the subunits in the same vertical line may belong to separate complexes co-migrating in BN-PAGE. This research was financially supported by the Academy of Finland (project numbers 307335 and 303757) and Solar Energy into Biomass (SE2B) Marie Skłodowska-Curie grant agreement (675006). The protocol is based on reference3. Acrylamide (AA) Sigma-Aldrich A9099 Caution: Neurotoxic! Schägger, H., von Jagow, G. Blue native electrophoresis for isolation of membrane protein complexes in enzymatically active form. Analytical Biochemistry. 199, 223-231 (1991). Kügler, M., Jänsch, L., Kruft, V., Schmitz, U. K., Braun, H. -P. Analysis of the chloroplast protein complexes by blue-native polyacrylamide gel electrophoresis (BN-PAGE). Photosynthesis Research. 53, 35-44 (1997). Järvi, S., Suorsa, M., Paakkarinen, V., Aro, E. -M. Optimized native gel systems for separation of thylakoid protein complexes: novel super- and mega-complexes. Biochemical Journal. 439, 207-214 (2011). Strecker, V., Wumaier, Z., Wittig, I., Schägger, H. Large pore gels to separate mega protein complexes larger than 10 MDa by blue native electrophoresis: Isolation of putative respiratory strings or patches. Proteomics. 10, 3379-3387 (2010). Porra, R. J., Thompson, W. A., Kriedemann, P. E. Determination of accurate extinction coefficients and simultaneous equations for assaying chlorophylls a and b extracted with four different solvents: verification of the concentration of chlorophyll standards by atomic absorption spectroscopy. Biochimica et Biophysica Acta (BBA) - Bioenergetics. 384-394 (1989). Blum, H., Beier, H., Gross, H. J. Improved silver staining of plant proteins, RNA and DNA in polyacrylamide gels. Electrophoresis. 8, 93-99 (1987). Aro, E. -M., et al. Dynamics of photosystem II: a proteomic approach to thylakoid protein complexes. Journal of Experimental Botany. 56, 347-356 (2005). Suorsa, M., et al. Light acclimation involves dynamic re-organization of the pigment-protein megacomplexes in non-appressed thylakoid domains. The plant journal for cell and molecular biology. 84, 360-373 (2015). Laemmli, U. K. Cleavage of Structural Proteins during the Assembly of the Head of Bacteriophage T4. Nature. 227, 680-685 (1970). Schägger, H., Pfeiffer, K. Supercomplexes in the respiratory chains of yeast and mammalian mitochondria. The EMBO Journal. 19, 1777-1783 (2000). Rantala, S., Tikkanen, M. Phosphorylation-induced lateral rearrangements of thylakoid protein complexes upon light acclimation. Plant Direct. 2, 1-12 (2018). Rantala, M., Tikkanen, M., Aro, E. -M. Proteomic characterization of hierarchical megacomplex formation in Arabidopsis thylakoid membrane. Plant Journal. 92, 951-962 (2017).